Manifold Greatness blog Inside take on a Folger, Bodleian, and Ransom Center exhibition on the creation and afterlife of the King James Bible on the 400th anniversary of its publication. The Folger Shakespeare Library’s King James Bible exhibition is going on the road! Forty public, university, and college libraries across the United States will host a smaller traveling version of Manifold Greatness: The Creation and Afterlife of the King James Bible beginning right away and continuing through July 2013. 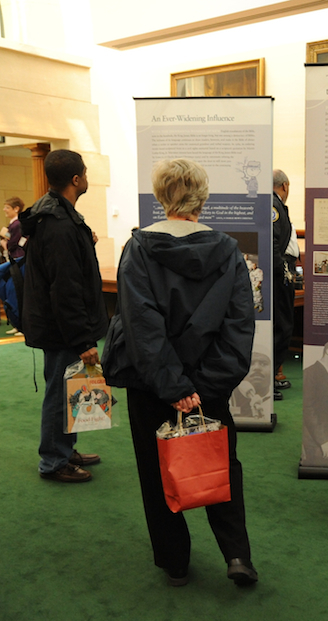 From California to Georgia and Vermont to Texas, the 14-panel exhibit will criss-cross the country bringing the story of the KJB to diverse library audiences of all ages. Tour sites have fascinating programs planned to honor the 400-year history of the King James Bible and its enduring importance in world culture—and we hope you’ll be learning about some of them here on the Manifold Greatness blog as well as the Manifold Greatness Facebook page, YouTube channel and playlist, Twitter feed, and Flickr account. There will be films, concerts, panel discussions, writing contests, lectures, plays, and readings—all dedicated to learning more about this remarkable work. A few library sites even have copies of the original 1611 King James Bible and other rare early Bibles to show their visitors. I and my team at the American Library Association’s program development and partnerships group in the Public Programs Office have been delighted to work with the Folger Shakespeare Library in organizing the library tour. Representatives from the forty tour sites gathered in Washington, DC, on September 22 and 23 for a working session that included the opportunity to view the major Manifold Greatness exhibition at the Folger Shakespeare Library and talk to the curators and designers. And now, in the months and years to come, they will present their own King James Bible programs and displays, which are sure to attract wide attention in their communities. In fact, the first sites will debut the traveling exhibit this week! To see if the exhibit will be coming to your area, please visit the itinerary on our ALA website or call the ALA Public Programs office for more information (312-280-5045). You can also check the locations and schedule pages on the Manifold Greatness website for the same information. The ALA Public Programs Office is grateful to the National Endowment for the Humanities for making this traveling exhibition for libraries possible, and to the Folger Shakespeare Library and the Bodleian Library at the University of Oxford, with assistance from the Harry Ransom Center of the University of Texas at Austin, for creating such a beautiful and informative exhibition. We expect the tour to be a huge success and a catalyst for individual learning and research across the country. Susan Brandehoff is Director of Program Development and Partnerships at the American Library Association (ALA) Public Programs Office. Manifold Greatness: The Making of the King James Bible (Bodleian Library Publishing, 2011) Learn more. Manifold Greatness: The Creation and Afterlife of the King James Bible has been made possible in part by a major grant from the National Endowment for the Humanities: Because democracy demands wisdom. The Manifold Greatness website has been awarded the 2012 RBMS Leab Exhibition Award in the “electronic exhibition” category. Learn more about the award from this American Library Association announcement.